Evaluating hypotheses and making judgements on the basis of well supported evidence solve problems in science. Medical and biological data mainly consist of measurement of assay conditions to support the proposed hypothesis. A prediction must test variables and scientist must acquire data from experiments to elicit an explanation or description to the scientific problem. Experimental results of the assay provide direct or indirect evidence to the theory. Therefore, several techniques have been developed to help researchers facilitate experimental design and to elucidate molecular mechanism of biological systems. Some techniques alone may provide unique evidence while still other complement other techniques. For this reason, investigators must be informed about the techniques and know them in detail. It is hard to follow up each technique specially for early career scientists and its applications for experienced researchers. The first volume of this book provides a training platform and application modules of each technique and may help individual investigators to guide research practices. 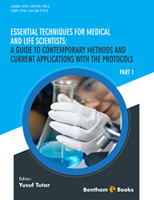 This book focuses on instrumental techniques and their applications in medicine and biological sciences. Chapter 1 discusses mass spectroscopy (MS) and this technique provides qualitative and quantitative measurements of biological samples. MS has several applications but have not been mainly employed in proteomics studies yet. However, recent developments in clinical applications of MS courage researchers to perform difficult assays precisely and rapidly. Structural elucidation of macromolecules form the basis of molecular biophysics and Chapter 2 discusses X-ray crystallography, Nuclear Magnetic resonance (NMR), Small Angle X-ray scattering (SAXS), and Cryo-electron Microscopy. Without detailed structure of a macromolecule, it is hard to understand the macromolecule interaction in biochemistry. So far, these methods have been employed in biological systems to reveal macromolecule structures. Each method has a unique site as well as overlapping functions however, all of them are useful to structural biologists, pharmaceutical, and medical scientists. Chapter 3 explains a unique technique; isothermal titration calorimetry (ITC). It is unique since the technique not only measures binding affinity but also it provides thermodynamic data. The thermodynamic data provides nature of interaction. ITC measures any interactions between different macromolecules, DNA, RNA, lipid, carbohydrate, protein (enzyme, antibody), and ligand of any type. The component of the assay may be more than two molecules and there is no molecular weight restriction for the assay. Since it measures heat differences as signal, opaque solutions and suspensions do not restrict measuring binding affinity. ITC also measures enzyme kinetics and the technique may also be coupled to spectroscopic techniques like fluorescence. ITC is an all in one instrument for scientist. The chapter discusses applications of ITC in different disciplines. Chapter 4 describes a common instrument of life science laboratory; reverse transcription polymerase chain reaction. This powerful method has found applications in medical, diagnosis, and forensics. Methodology and applications of the technique are explained thoroughly in this chapter. This book is designed not only for early career young scientists (graduate students or postdoctoral associates) but for scientists who are experts in a particular technique but want to use different applications for their experimental set up. Next volume of the book will provide chapters for different analytical techniques. Dr Tutar would like to acknowledge networking contribution by the COST Action CM1407 “Challenging organic syntheses inspired by nature - from natural products chemistry to drug discovery”.